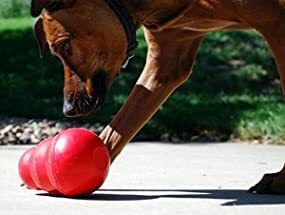 We switched over to the Kong Wobbler toy for this– it’s a better deal, more durable, and our dog likes it much better. Get the Kong wobbler here. The Wobbler is a fabulous toy for playtime providing both mental challenge and physical activity for your dog. The whole family will enjoy watching the Wobbler in action. 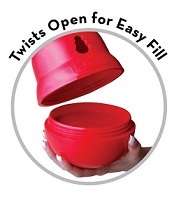 To start treat dispensing or mealtime feeding unscrew the Wobbler and fill with food or treats. In the beginning make sure your dog observes you filling the Wobbler with food. Screw top on tightly! 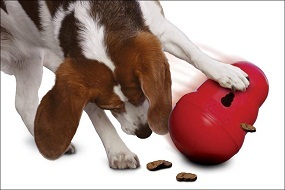 Demonstrate the use of the toy to your dog- make it a big event. Let them sniff the Wobbler opening. Push it wobble it and roll it-until some of the food or treats are released. Get excited about the toy- your dog will too! 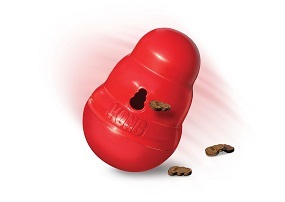 Most dogs will quickly learn to use their nose or paws to move the Wobbler and release the treats. Praise your dog each time a treat is released. Your praise and the treat reward will encourage continued involvement. It also helps to introduce the Wobbler when your dog is hungry and thus more motivated to work for the treats. Often one demonstration is all that’s needed in order for your dog to catch on. Repeat the process several times if necessary. It’s recommended that you start with a number of high-value small treats for maximum canine motivation and easy dispensing. This method ensures a rapid training period. As your dog gets more comfortable using the Wobbler you can increase the challenge by reducing the number of treats inside using larger treats and/or a combination of large and small treats. However always make sure the treats are not too big to fit through the dispensing hole. The KONG Wobbler is an excellent alternative to traditional bowl feeding extending the joy of mealtime and preventing unhealthy gulping. Using the same basic instructions as above fill the Wobbler with up to 2 cups of dog food and then screw the top on tightly. Refill as needed. Use the same amount of dog food as instructed on your dog food bag.